We keep body, mind, and soul in motion. Suitable for MEN as well! Newcomers can be integrated at the begin of every evening. 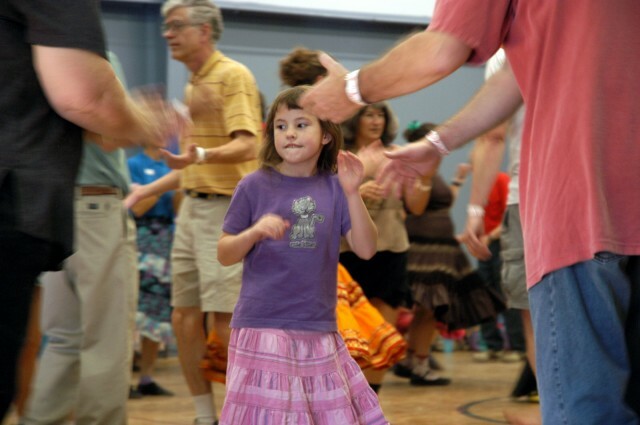 Guests from other Square Dance Clubs are welcome, long before the Mainstream Graduation. A mixture of Contra and Square Dancing. If at least 2 couples will stay to dance the Mainstream program, I will add another half hour. BTW: 25% of the "financial applause" I earn as a dance leader goes to the Christoffel Blindenmission - and I am sure this money works helpful. As long as public transportation is operating, I will try to keep Open Country going. But if due to terrible weather conditions busses and trams will not run, then of needs Open Country must be canceled for that day. Square Dance - what is it? And what is the difference to other forms of dancing? We do not want such guys to attend our dances. Visiting callers are welcome to call a guest tip, provided they can adjust to the style of the group. I have a Hilton MA-150 amplifier where any audio equipment can be plugged in; but no turntable, sorry.